It didn’t take me too long since my last post to come up with a nominee for the first-ever intercollegiate field hockey game in the United States. 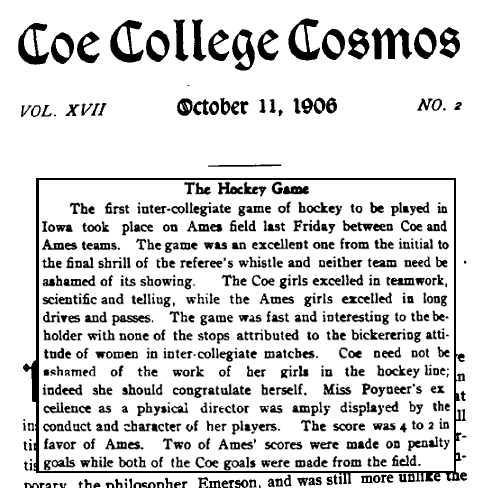 The October 11, 1906 issue of the Coe College Cosmos contains an account of a game between the women’s field hockey teams of Coe College and Iowa State (referred to in the article as “Ames.”) The game is reported to have taken place on Friday, October 5, 1906 in Ames, with host Iowa State winning, 4-2. The write-up refers to the game as being “the first inter-collegiate game of hockey to be played in Iowa,” and I haven’t found anything to contradict that idea. In fact, I haven’t found any evidence that there were any intercollegiate field hockey games played in the entire country prior to the Iowa State/Coe matchup. Springfield College’s men played intramural games, as did the women of Vassar, Bryn Mawr, Smith, Mount Holyoke, Radcliffe and Wellesley. Bryn Mawr, in fact, did have a varsity team that played outside opponents as early as 1902, but these games were against teams from local cricket clubs rather than other colleges. So this game seems like a pretty strong candidate for the title of first intercollegiate field hockey match in the U.S., but I am not yet ready to declare it the winner. Posted on December 29, 2014 December 3, 2015 by Eric MeanyTagged Charlotte Poyneer, Coe College, Iowa State.